RadioProcessor is SpinCore Technologies' general purpose, broadband, radio frequency (RF) digital data acquisition and excitation system. The RadioProcessor can serve as a complete system console for Nuclear Magnetic Resonance (NMR) or Nuclear Quadrupole Resonance (NQR) with spectrometer frequencies from 0 to 100 MHz (certain restrictions apply, see the Manual). This unique digital system is housed on a small form factor USB board, providing users with a compelling price/size/performance proposition unmatched by any other device on the market today. 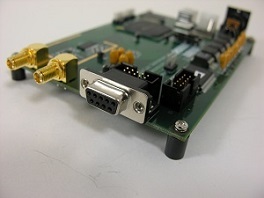 Integrates excitation and acquisition components onto a single board. Directly captures and digitally demodulates IF/RF signals using quadrature detection. The desired baseband bandwidth is user definable through software. Generates completely formed RF excitation pulses as well as high resolution digital control signals. Supports 2 analog I/O channels and 4 digital output channels. Select models have Arbitrary Waveform Generation (AWG or 'shaped pulse') capability. Maintains signal coherence between excitation and acquisition systems at all frequencies. Autonomously signal-averages the baseband data between multiple acquisitions. Samples the input signal at up to 75 Ms/s with 14-bit resolution. Captures input signals above the Nyquist frequency, up to approximately 100 MHz. With signal detection enabled, provides up to 10 MHz bandwidth of baseband data. Direct Digital Synthesis generates RF output pulses with 14-bit resolution up to 300 Ms/s clock frequency. Standard clock stability of 100 ppm, with optional oven-controlled clock oscillator (OCXO) of 200 ppb. Pulse setting resolution up to 13.3 ns, pulses from 66.6 ns to days per interval. Zero-latency phase and frequency switching. Wide-bandwidth input amplifier and A/D converter allow for undersampling applications. High Resolution Solid State NMR Spectra, Submitted by Dr. Tom Pratum, Western Washington University, USA. RadioProcessorUSB board (Power supply sold separately). iSpin-NMR - complete mobile NMR system. Interfaces and examples - LabView, Matlab, Felix, Function Generator GUI. Money-back guarantee - 30 days.